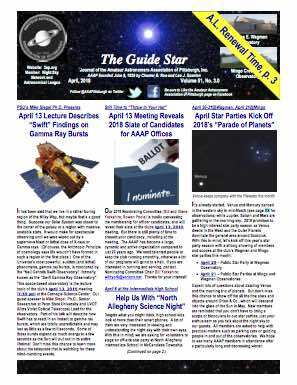 The Amateur Astronomers Association of Pittsburgh will meet 7:30 PM, Friday, March 10, 2017, Science Stage, Carnegie Science Center, Pittsburgh, PA 15212. High-Energy Astrophysics: the Fascinating World of Supernova Explosions and Pulsars. Presenter: Harsha Blumer, PhD, Post-doctoral researcher, West Virginia University , Morgantown, WVA and Geeenbank Observatory. Lecture will be held on the Science Stage, Carnegie Science Center, Pittsburgh, PA at 7:30 PM, Friday March 10, 2017. An observer looking at the night sky sees a peaceful, never changing universe. However, there exists a violent and highly energetic universe concealed by this serene starlit sky. A universe that is filled with catastrophic blasts from the death of massive stars or supernova explosions, which are nature’s spectacular fireworks, to the birth of exotic stars such as the neutron stars (incredibly dense stellar objects as big as the city of Pittsburgh, but with a teaspoonful of neutron star material weighing about billion tons), or the magnetars – the most magnetic stars with a magnetic field of about a hundred trillion fridge magnets. The launch of high-resolution X-ray and gamma-ray telescopes in the last decade has offered new perspectives on our understanding of these sources and the prospects for continued discoveries are very promising. I will talk about these exotic stars that provide us with a unique opportunity to explore the behavior of matter and energy under the influence of its most extreme environments and magnetic fields, impossible to be reproduced on earth. Harsha Blumer is a postdoctoral fellow in the Department of Physics and Astronomy at the West Virginia University. She has a Master of Science degree in Physics from the Mahatma Gandhi University and a Master of Technology degree in Space and Atmospheric Sciences from the Center for Space Science and Technology Education, affiliated with the United Nations. About 10 years ago, she moved to Canada where she did her PhD studies in Astrophysics and worked as a Postdoc at the University of Manitoba, Winnipeg. She has been recognized with numerous awards and honours during her academic career, including the Governor General Academic Gold Medal in 2014 which is the most prestigious award given to a doctoral student in Canada. Her research is focused on studying the aftermath of supernova explosions of stars, pulsars, and magnetars. At WVU, she is also the Project Director for the Pulsar Search Collaboratory program, a joint project between the Green Bank Observatory, West Virginia University, and 13 other institutions throughout the United States, aimed at involving high-school students and teachers in pulsar searching to give them real research experience with the Green Bank Telescope. After an intermission the March business meeting follows. The agenda will include overview of current and upcoming club activities and astronomical events. Parking is $5 payable at the parking kiosk in the lobby. The upcoming program of 2016-17 Meeting Speakers may be downloaded here. Please see the AAAP Guide Star Newsletter and the AAAP Facebook Page for additional information. Congratulations to Tom Reiland on naming “Space Tunnel” as a new asterism. AAAP Member, Bill Snyder ‘s Wizard Nebula is the February 15, 2017 Astronomy.com Picture of the Day. 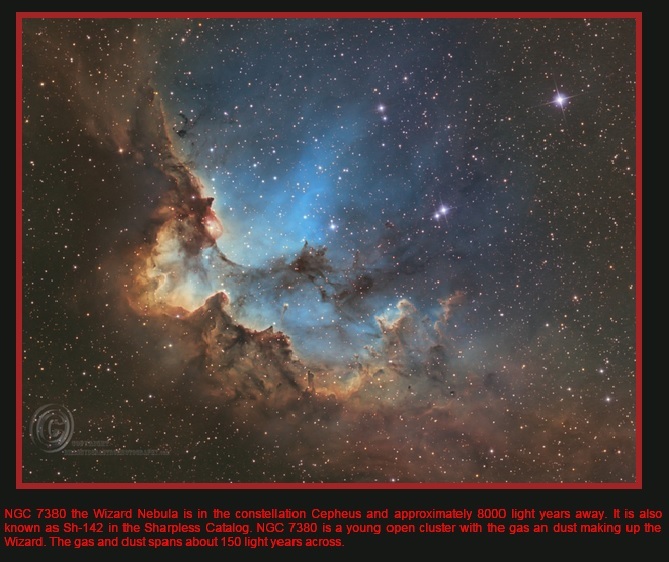 Wizard Nebula shown below from Bill’s astrophotography website. Congratulations, Bill, on another winner! Bill Snyder’s (NGC 7380) the Wizard Nebula is February 15, 2017 Astronomy.com Picture of the Day. The Wagman Observatory telephone and voicemail (724-224-2510) are restored. Thank you for your patience while the outage was rectified. The first AAAP Star Party of the 2017 Star Party Season is scheduled for March 31 at the Wagman Observatory. The 2017 Wagman Star Party Brochure PDF file is here -Wagman_Sched_2017 and under the About tab. The Amateur Astronomers Association of Pittsburgh will meet 7:30 PM, Friday, February 10, 2017 at the Carnegie Science Center, 1 Allegheny Ave, Pittsburgh, PA 15212. The meeting is free and open to the public. The featured presentation for February, the annual planetarium show will be provided by the Carnegie Science Center Staff. Members and guests should convene on the second floor (ramp or elevator available) at the Buhl Planetarium where we will start with the planetarium show presentation at 7:30 PM. At the time of the show, the room darkens and entrance door closes until the show ends. Please arrive before the doors close. The show will last about 30 minutes. After a short recess the business meeting will begin. We distribute the Night Sky Network Outreach Award Pins at this meeting. NSN Pins are awarded to members participating in 5 or more NSN eligible outreach events and feature an astronomy event of the coming year. This year’s pin commemorates the August 21, 2017 Solar Eclipse. There is a Penumbral Lunar Eclipse from 5:34 – 9:53 PM, coinciding with the February 10 meeting. Some AAAP members with binoculars and perhaps dobs, weather-permitting will be available at the entrance to provide a detailed view of the Moon in Penumbral Eclipse. If the skies are clear, plan to arrive in time to get a closer look at this phenomenon prior to the meeting start. The agenda will include overview of current and upcoming club activities and astronomical events. Parking is $5 payable at the parking kiosk in the lobby. The upcoming program of 2016-17 Meeting Speakers may be downloaded here. Please see the AAAP Guide Star Newsletter and the AAAP Facebook Page for additional information.